The area has wonderful long beaches and plenty of golf courses. 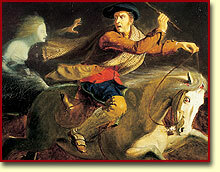 The Burns heritage trail is on its doorstep as are ferries to Arran and Little Cumbrae. There are marinas at Ardrossan and Largs and West Kilbride, a small town a 10 minute drive up the coast, is Scotland's Craft Town. 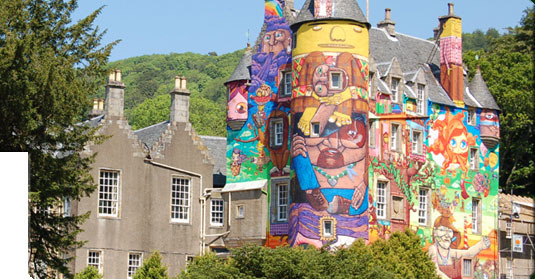 The family home of the Earls of Glasgow, Kelburn has long been an inspiration for adults and a paradise for children. The castle, dating back to the 13th century, still lived in by the present Earl and family, is open to the public in July and August and provides an impressive background to exotic gardens, famous trees and many features of historical interest. The Kelburn Glen with its waterfalls and deep gorges is regarded as one of Scotland's most beautiful woodlands and leads to spectacular views over the islands of the Firth of Clyde. The Country Centre includes: Pony Trekking & Riding School, Licensed Café, Indoor Playbarn, The Ice Cream shop, Pet's Corner, Gift Shop, Ranger Service Events, Adventure Course, Falconry Centre & Displays. (Description taken from Kelburn Estate website: www.kelburnestate.com). Culzean is one of Scotland's best loved Castles, offering something for everyone to enjoy. Situated on the South Ayrshire coast, just off the A719, Culzean Castle is located 12 miles south of Ayr and 4 miles west of Maybole and is a National Trust for Scotland property. See the website www.nts.org.uk/Property/Culzean-Castle-and-Country-Park for details of events, opening times and entrance fees. For 200 years, the beautiful scenery of Alloway and its special connection with the life and works of Robert Burns have drawn visitors to this stunning Ayrshire village. Burns National Heritage Park offers visitors a chance to experience the rich heritage of Burns within the environment that inspired his imagination. See the website www.burnsheritagepark.com for details of the park, attractions and events. 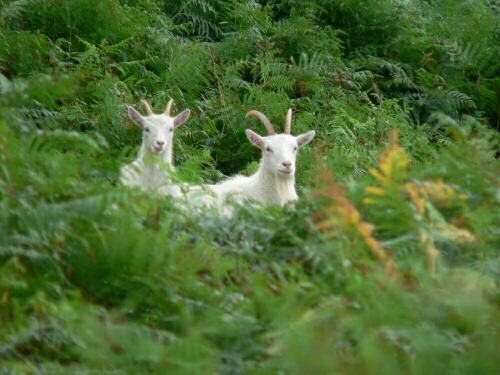 Wild white goats on Holy Isle. A short walk out of the Stick House and up to the top of the road offers the visitor some fantastic views of the Isle of Arran with its spectacular mountain scenery. From the Stick House to the ferry terminal in Ardrossan takes less than 10 minutes by car and the ferry journey to the island is 55 minutes. For a guide of the island, ferry times and prices, events, things to do and links to many other websites for visitors, visit the website: www.visitarran.net for details of things to do on the island, . Holy Isle, a small island just off the south end of Arran, can be reached by boat from Lamlash. On Holy Isle there is the Centre for World Peace and Health (www.holyisland.org), a retreat that runs a wide range of courses throughout the year.